Voivod are a progressive thrash metal band from Jonquiere, Quebec, Canada, with a very distinct sound. Formed by Denis "Piggy" D'Amour, Michel "Away" Langevin and Jean-Yves "Blacky" Theriault in 1982, the fledging group soon found the perfect singer in Denis "Snake" Belanger. A blend of thrash with some progressive rock thrown in (on Killing Technology), and lyrics leaning heavily on sci-fi imagery. 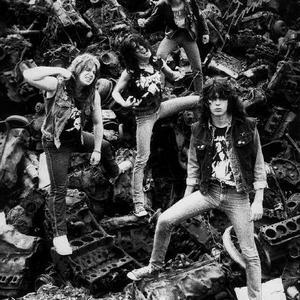 One of the first Canadian punk and thrash bands to enjoy success outside of Canada, they released four albums in the mid '80s before being signed to a major label. War And Pain in 1984, Rrroooaaarrr! in 1986, Killing Technology in 1987, and Dimension Hatross in 1988. Their blend of thrash and progressive rock caught the ear of MCA Records, who signed them and released their next album, Nothingface in 1989. The video of their Pink Floyd cover, Astronomy Domine, got tons of MTV airplay. They would headline a club tour with bands like Soundgarden and Faith No More, relative unknowns at the time, opening for them. Things started slowly sliding downhill for them after, their next album being poorly received, 1991's Angel Rat. 'grunge' was taking hold, with bands such as their former opening act, Soundgarden, enjoying a rise to stardom. Blacky left the band quickly after Angel Rat's release. 1993 saw the release of The Outer Limits album. Following the subsequent tour, Snake quit Voivod. The former Liquid Indian man, Eric "E-Force" Forrest replaced Blacky and Snake in one fell swoop on bass and lead vocals, and would stay with the band for two albums, 1995's Negatron and 1997's Phobos. 2000 saw an EP (Kronik) and live album (Lives), and in 2001 a car accident invalidated E-Force with a broken back. The group was put on hiatus, until eventually the decision was made to reform the band with Snake. Voivod fan Jason Newsted, fresh from Metallica, filled the vacant bass slot. This version of the band would go on to release 2003's self-titled album, Voivod. Guitarist Denis "Piggy" D'Amour sadly died on 25th August 2005 from colon cancer aged 45. After his diagnosis he spent the last 2 months of his life recording ideas & guitar parts for several albums worth of new songs. After his death the rest of the band completed work on Voivod's 14th album, Katorz, released in July 2006 and Infini in 2009.